[170 Pages Report] The artificial intelligence (AI) in marketing market was valued at USD 5.00 Billion in 2017 and is likely to reach USD 40.09 Billion by 2025, at a CAGR of 29.79% during the forecast period. The base year considered for the study is 2017, and the forecast period is between 2018 and 2025. This study involves an extensive usage of secondary sources, directories, and databases (such as Hoovers, Bloomberg Businessweek, Factiva, and OneSource) to identify and collect information useful for this technical, market-oriented, and commercial study of the AI in marketing market. The primary sources mainly comprise several industry experts from core and related industries, along with preferred suppliers, manufacturers, distributors, service providers, reimbursement providers, technology developers, alliances, standards, and certification organizations related to all the phases of the industry’s value chain. 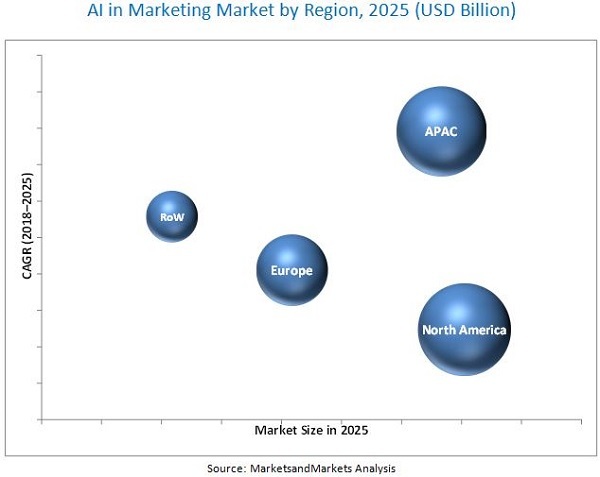 Both top-down and bottom-up approaches have been used to estimate and validate the size of the AI in marketing market and other dependent submarkets. 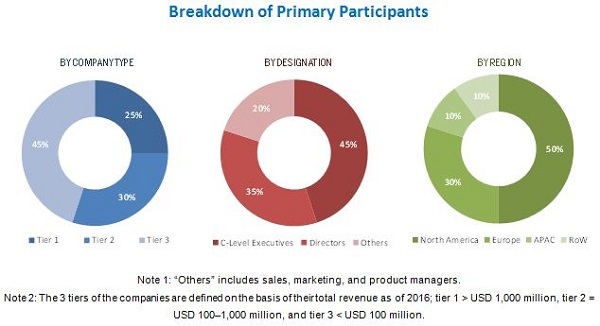 After arriving at the overall market size, the total market has been split into several segments and subsegments, which have been verified through primary research by conducting extensive interviews with industry experts such as CEOs, VPs, directors, and executives. The market breakdown and data triangulation procedures have been employed to complete the overall market engineering process and arrive at the exact statistics for all segments and subsegments. The breakdown of profiles of primary respondents has been depicted in the following figure. Companies covered in the AI in marketing market report are NVIDIA (US), Intel (US), IBM (US), Micron (US), Samsung Electronics (Korea), Xilinx (US), Amazon (US), Alphabet (US), Facebook (US), Microsoft (US), Salesforce (US), Baidu (China), Sentient Technologies (US), Albert Technologies (Israel), and Oculus360 (US). Some of the other key companies included in the report are Twitter (US), Oracle (US), InsideSales (US), Persado (US), Mariana (US), Drawbridge (US), Narrative Science (US), Appier (US), GumGum (US), and Zensed (Sweden). Analysis of industries in the AI in marketing market in different geographic regions. Customization can be provided on the country-wise analysis of the AI in marketing market with respect to industries. According to MarketsandMarkets, the artificial intelligence (AI) in marketing market is expected to be valued at USD 6.46 Billion in 2018 and is likely to reach USD 40.09 Billion by 2025, at a CAGR of 29.79% between 2018 and 2025. Growth in the adoption of customer-centric marketing strategies, increase in demand for virtual assistants, and increased use of social media for advertising are the major factors driving the demand for AI-based marketing and sales solutions. In this report, the AI in marketing market has been segmented on the basis of offerings, deployment types, applications, technologies, end-user industries, and regions. Among offerings, software holds the largest share of the overall AI in marketing market owing to the developments in AI software and related software development kits. Among applications, virtual assistant is the fastest-growing application. Virtual assistants are increasingly being used for sales purposes as they are designed to increase productivity and eliminate time-consuming lead generation activity, thus allowing salespeople to focus on other productive parts of the job. On the basis of technologies, the market has been segmented into machine learning, natural language processing, computer vision, and context-aware computing. Machine learning’s ability to collect and handle big data, along with its increased ability to perform previously impossible calculations, is fueling the growth of the market for machine learning. The AI in marketing market in APAC is expected to grow at the highest CAGR between 2018 and 2025. This growth can be attributed to the adoption of AI services in end-user industries such as retail, BFSI, enterprise, and media and advertising in countries such as Japan, China, Australia, and South Korea. The limited number of AI experts is a major restraint for the AI in marketing market. Companies covered in the AI in marketing market report are NVIDIA (US), Intel (US), IBM (US), Micron (US), Samsung Electronics (Korea), Xilinx (US), Amazon (US), Alphabet (US), Facebook (US), Microsoft (US), Salesforce (US), Baidu (China), Sentient Technologies (US), Albert Technologies (Israel), and Oculus360 (US). Some of the other key companies included in the report are Twitter (US), Oracle (US), InsideSales (US), Persado (US), Mariana (US), Drawbridge (US), Narrative Science (US), Appier (US), GumGum (US), and Zensed (Sweden).